With hopes to reconnect to a childhood favorite, I attempted to make panna cotta at home. I am still not able to achieve that perfect consistency I really like, but this is the closest I can get. Hopefully in time and with practice I will. Here is an adapted recipe from an online cooking source. The sauce is a bottled strawberry concoction. *Half & half, buttermilk, whole milk, and/or sour cream may be substituted for part of the cream. 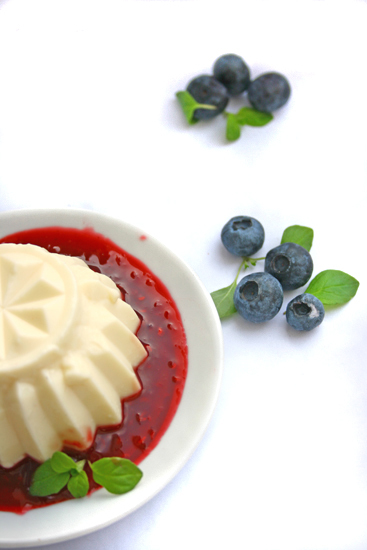 Any assortment of fresh, seasonal fruit may be served with panna cotta, but berries are especially nice. To use other ripe, soft fruits, such as cherries, peaches or apricots, just remove the stones and peels as necessary and cut them into thin slices or bite-size pieces. They could be made into jam-like sauces as well. Strain hot cream mixture into a large glass measuring cup with a pouring spout; pour into ramekins or custard cups. NOTE: Don’t skip the straining step as it removes any bits of undissolved gelatin and insures a nice smooth dessert. Also, don’t let the cream mixture cool before straining. If using a vanilla bean, lightly swirl the cream to distribute the seeds evenly. Refrigerate for at least 3 hours or overnight. To unmold and serve, carefully dip bottom of each ramekin in a baking pan of hot water briefly. Run a thin knife around edge of each ramekin to loosen it from the inside of the bowl. Wipe the outside of the mold dry and place on individual chilled serving plate (topside down). Invert the custard onto the plate and carefully lift off ramekin (shake gently to release). Garnish with berries or fruit or a favorite sauce of your choice. This looks so fresh and wonderful. 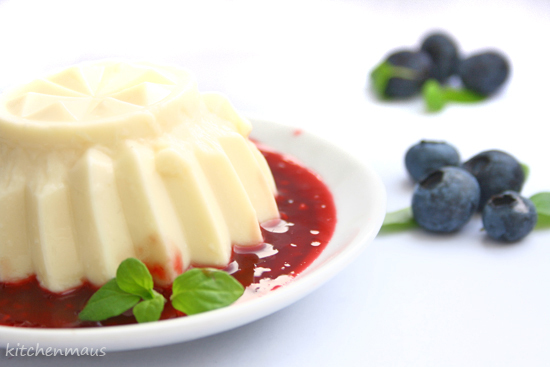 I love panna cotta but have yet to try making it. That looks wonderful. It has been forever since I had panna cotta. This looks like a commercial sa TV Sis!! ang ganda ng shot!! i like!!! sana kapoit bahay lang kita and i will ask you to teach me!! hulog k ng langit in anyway sakin sis!! mwah!! !